Almost every town along the Cote-d’Or has a delicious restaurant for you to dine in and multiple vineyards and chateaus for you to explore the region’s rich history of wine. However, the king of all these towns is Beaune, the capital of Burgundy wines. Beaune is on the Route des Grand Crus which runs from Beaune in the north to Autun in the South. Strategically located halfway along the wine route, Beaune makes as a great base for exploring other small wine towns. Montrachet, Pommard and Nuits-Saint-Georges are less than a 20-minute drive away. As Beaune is a walled city, you’ll find that many of its battlements, ramparts and moats survived in good condition, making a walk through the cobbled streets of Beaune feel straight out of a fairytale. Beaune also has a history with royalty as the town is closely linked to the Dukes of Burgundy. Another piece of history is on the Hotel-Dieu where a polychrome renaissance roofing style can be found. Dubbed the Burgundy Tile, this opulence was a status symbol reflecting its owner. Monuments from pre-Roman and Roman eras, through both the medieval and renaissance period can be found at every corner of this historic town. Beaune is often visited from May to August. In July, there’s a month-long music festival focused on baroque opera, known as the Baroque Festival de Beaune. In November, The Three Glorious Days wine festival is held with tastings, a street fair and a large-scale wine auction that benefits local charities. A half-day would suffice if you’re solely in Beaune to sightsee. If you would like to go for wine tastings and tours, an extra day would be perfect! Stay for the night and witness the city lit up for “Les Chemins de Lumieres” which happens from June to September. 7 monuments are highlighted, which you can enjoy on a stroll around the city after dinner. Beaune is a small charming town with people visiting from all over. Dress according to the season. If you are visiting wine cellars, it’s a good idea to take a sweater with you even if the weather is warm outside as it be chilly indoors. In 1442, Nicolas Rodin founded the charity-run Hospices des Beaune to aid the war-torn town. With donations received over the century, the Hospices became Burgundy’s largest landowners of vineyards. With their wine estate of 60-hectares, they host an annual wine auction in November. Now, Hotel-Dieu is a museum that lives on as a stunning work of Burgundian architecture and houses the iconic Van der Weyden’s Last Judgement altarpiece. Art collector Jean Arniot spent 25 years acquiring more than a thousand works of art by Surrealist artist Salvador Dali. Since 2011, the Dalineum on Place Monge has housed 100 works of art from drawings to sculptures for all to see. Among them is a reproduction of the famous Mae West Lips sofa. Do note that this a rather small exhibit but interesting as it’s from a private collection. Beaune’s town centre is a charming sight and within its monuments are little surprises. You’re in for a treat with the Burgundian Romanesque architecture of the Collégiale Notre-Dame. There’s a 12th century statue of the Virgin Mary with child and exquisite tapestries from the 15th century that chronicles her life. If it’s your day, you might even hear someone playing the Organ. Take a TGV train to Beaune from Paris, Mulhouse and Lyon with travel times around 2-hours. Do note that the train from Paris has a connection in Dijon. A bus from Paris will take about 3 and a half hours. Tickets are available online. The nearest airport to Beaune is the Dole-Jura airport which is a 40-minute drive away. It’s 3 and a half hours from Charles de Gaulle aiport and 1 and a half hours from Lyon-Saint Exupéry. A drive from Paris takes about 2 and a half hours while from Lyon, it’s only 45-minutes. Beaune is accessible by the A6, A31 (towards Dijon, then Lille or Nancy) and A38 (towards Besançon, Basel) highway. By the A6, take exit no. 42 (Savigny-Lès-Beaune/Beaune-Saint-Nicolas) or exit no. 24.1 (Beaune Centre/Beaune-Hospices). Fancy some tapas? With a terrace overlooking the Notre-Dame church and an impressive wine list, it’s a great place to end the evening! Located in an elegant vaulted cellar, dine here to enjoy traditional Burgundy cuisine. Their wine list is extensive and includes a fine selection of Champagne. A gem tucked away on Rue Paradis! You won’t burn a hole in your wallet as you dine at this quaint restaurant. Book in advance! With opulent decor and Louis XIV furnishings, live like a royal! Le Cep is also known for their excellent gourmet cuisine. A luxury hotel to explore Beaune’s finest! Features a charming garden terrace and a cellar tasting room to sample local delights. In the spirit of Burgundy, stay at this heritage wine house. You’ll be able to sightsee easily as it’s 3-minute walk to town. With an extensive selection of wines, this wine market will help you discover the best of the region. They also organise regular wine tours and tastings. With an all-year round, 7-day a week opening, be sure to stop by! Founded by a mother-daughter duo, the Cook’s Atelier will introduce you to gastronomic culture as you taste quality seasonal produce and learn timeless French cooking techniques. Wander through Beaune’s farmers’ market and spend a whole day cooking (and eating)! 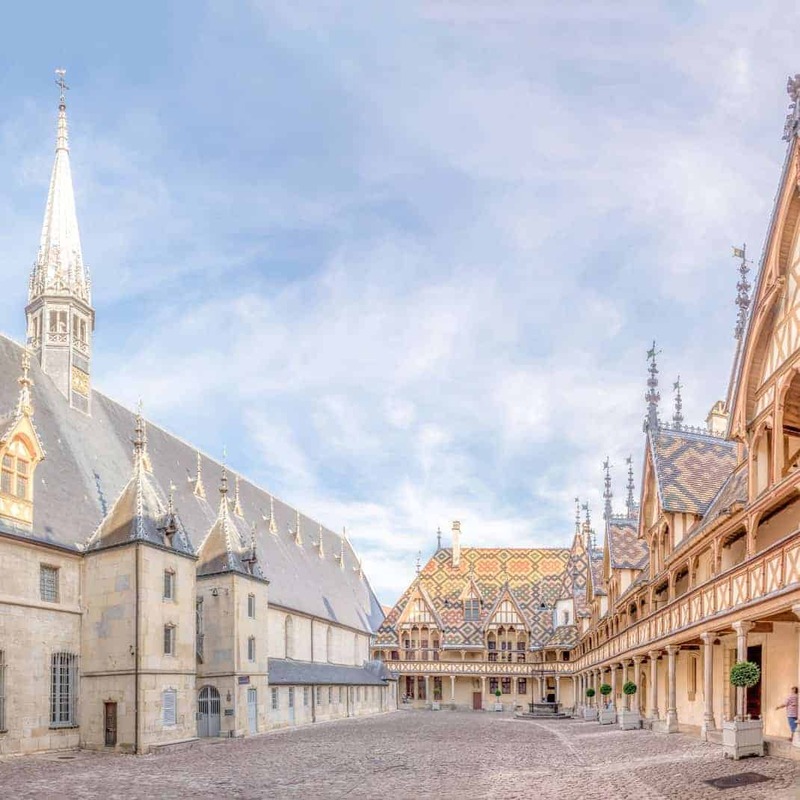 This guided tour will take you around Beaune and is available in 10 languages with a special commentary available for kids. It’s a 40-minute ride and is priced at €7.50 for adults and €4.50 for children (ages 3 – 12).